PARIS -- Floodwaters were nearing their peak in Paris on Saturday, with the rain-swollen Seine River engulfing scenic quays and threatening wine cellars and museum basements. Unusually heavy rains have engorged the Seine and other rivers in the region, forcing a halt to all boat traffic in Paris, including tourist cruises. Some quay-side restaurants were submerged, and some roads and parks were closed as a precautionary measure -- along with the bottom floor of the Louvre Museum. Groundwater was also seeping into some Paris cellars, and authorities warned residents of some neighborhoods to remove any valuables. France has only seen rain similar to this three times over the New Year period in the last century, according to the BBC. However, authorities said Saturday that the flooding won't be as bad as forecast earlier this week. The river is expected to peak in Paris on Sunday at 6 meters or less (19 feet, 8 inches) on the Austerlitz scale -- below the 6.1 meters reached in exceptional floods in 2016, and well below the 8.6 meters hit in record floods in 1910. In normal times, the river measures about 1.5 meters (4 feet, 11 inches) on the Austerlitz scale. 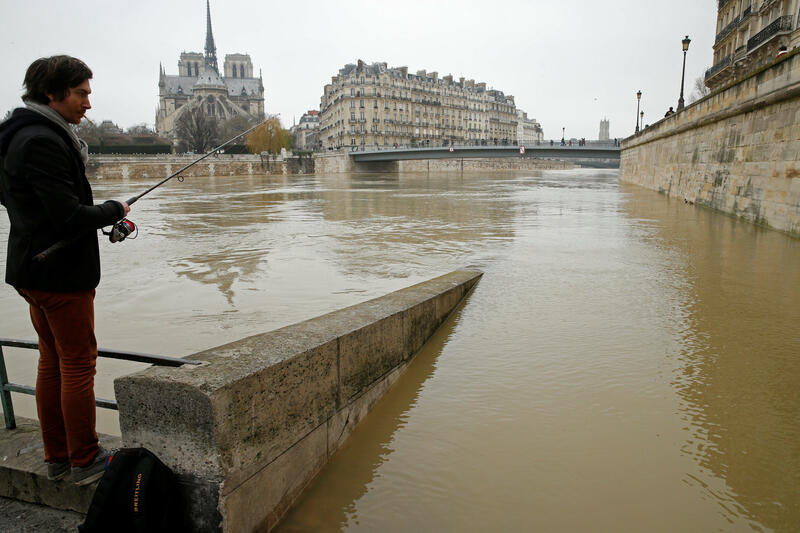 Parisians seemed to be taking the high water and closures in stride, while tourists took photos of water-covered embankments Saturday, as workers inspected water infiltrations on a road. Meanwhile, fishermen -- and a visiting flock of cormorants -- took advantage of the rushing, boat-free river to look for lunch. The Seine runs in a deep channel that limits the impact of swelling waters. In towns that are smaller, however, people have been punting boats along streets that are flooded. The rising waters are also reportedly flushing rats out from below ground, the BBC reports.